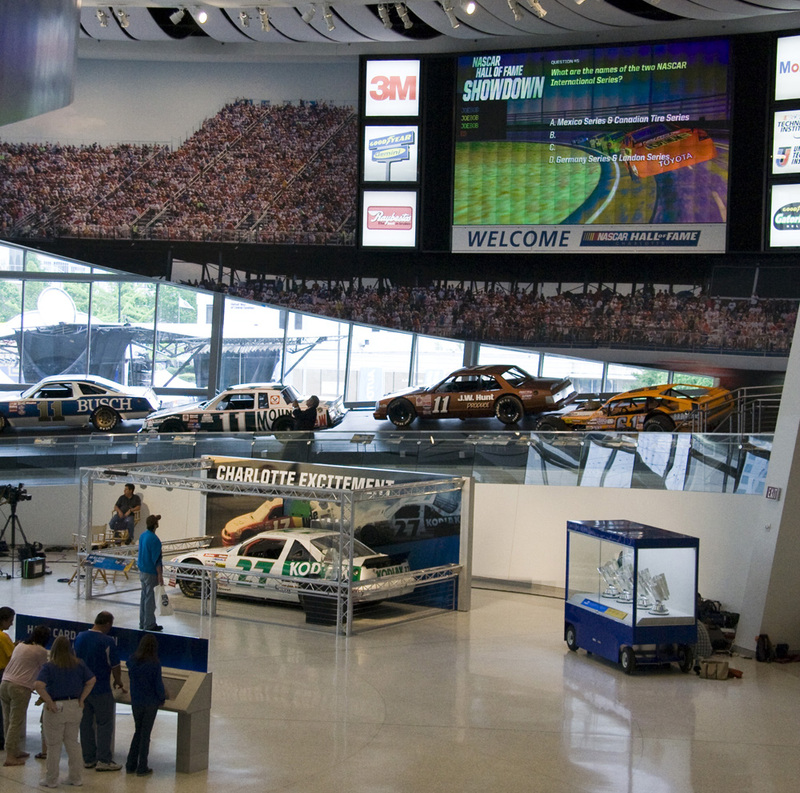 Unified Field was tasked with developing all of the interactive installations for the new NASCAR Hall of Fame, which was completed in May of 2010. 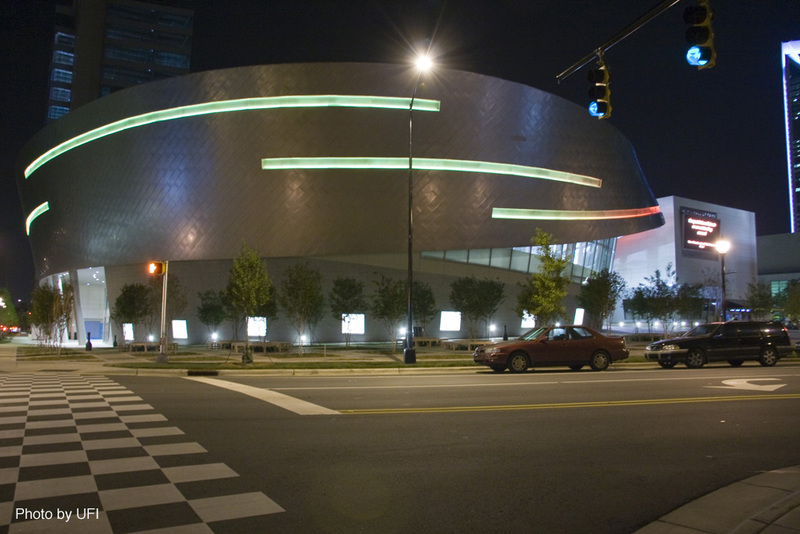 The project was designed in partnership with the exhibit design firm Ralph Appelbaum Assc. 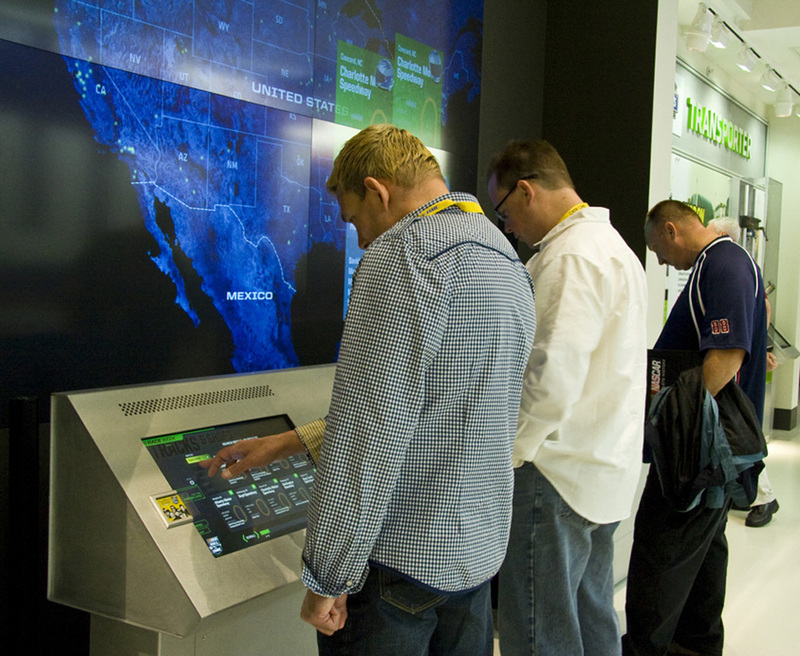 UFI had a massive role in the media and software development of over 30 separate interactive exhibits. A sophisticated database system was also developed in order to track the progress of each guest through the museum. 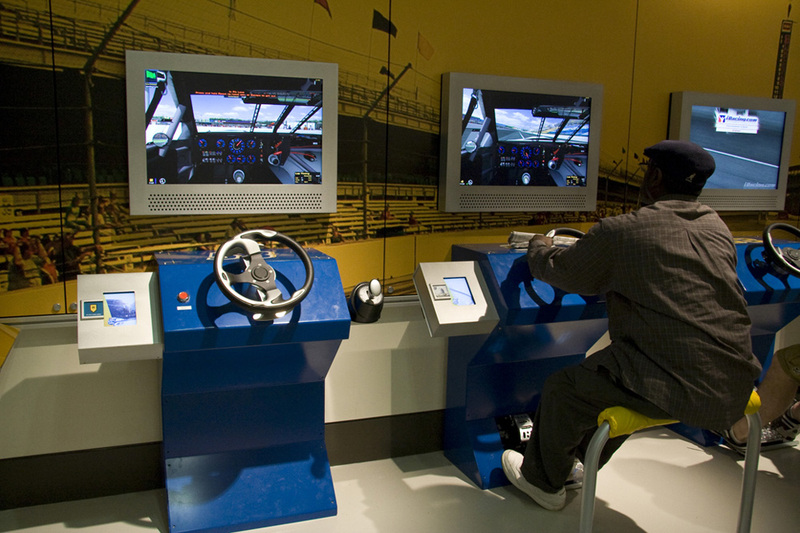 Each visitor could select a “host”, who was a famous driver of their choosing that would guide the visitor through the exhibit by virtually introducing them to each interactive. 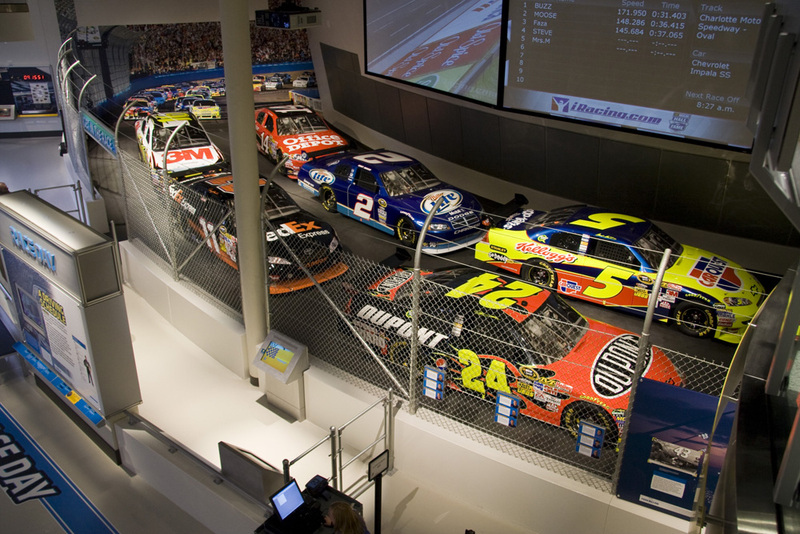 The exhibits were activated though the use of an RFID card (“HardCard”) which was also used to call up the user’s host, previous scores, and media that they had saved for later viewing online. UFI helped coordinate everything from film production, database and statistical analysis, graphic and interface design, to software design and information architecture. The interactive software development was split between 6 software engineers at peak production. 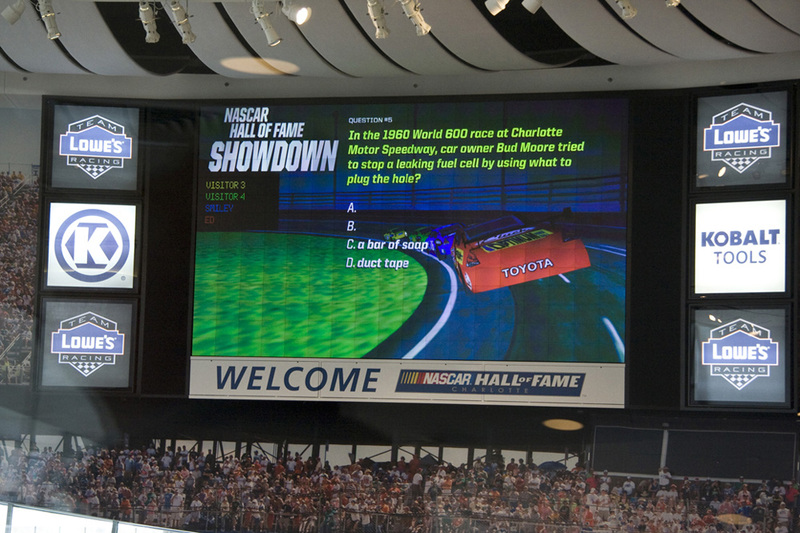 I led the development on a number of interactives, including: Qualifying and Racing Simulator, which had to communicate with a third-party racing simulator application (iRacing); Inspection, which taught visitors about what pre and post-race inspectors do through a series of mini inspection games; and Fan Billboard, which was a trivia and polling system where up to 4 visitors could answer trivia questions while racing one another virtually. 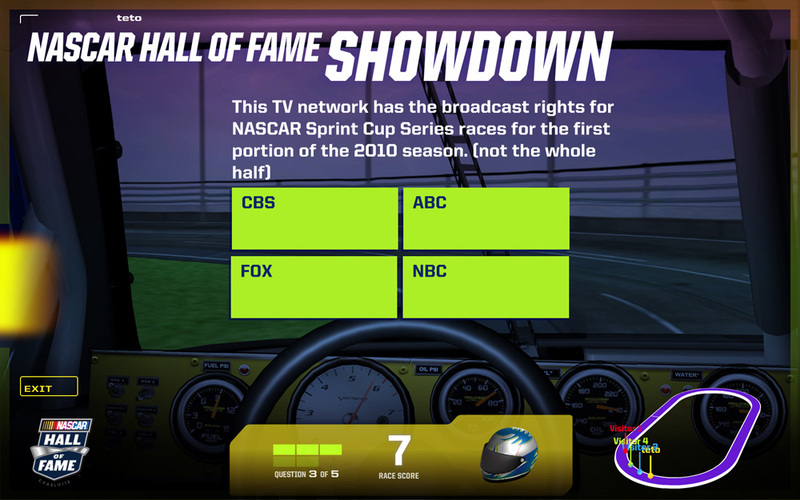 This was a large multiplayer trivia game that was an introduction to the entire museum and would also split time with archived NASCAR videos, allow new visitors to check in and be able to poll visitors about aspects of NASCAR. 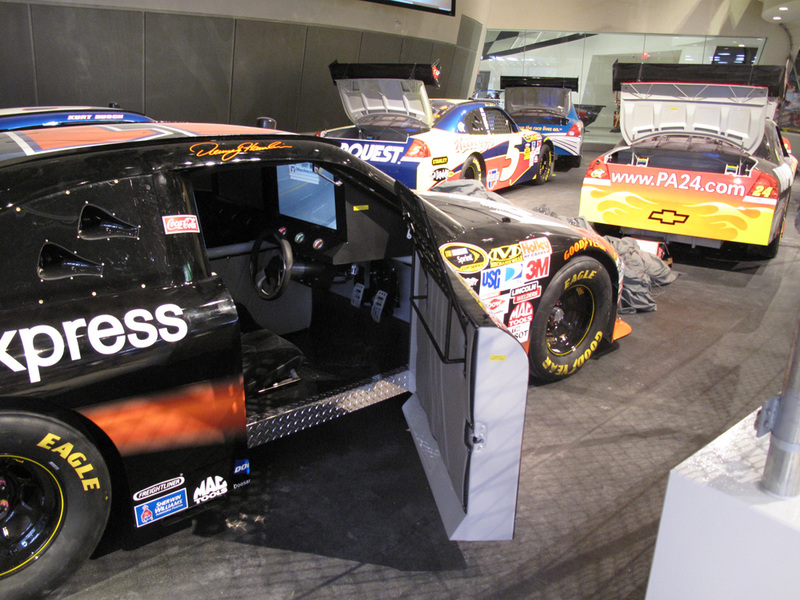 Each 3D car corresponds to a player and they move and pass each other as players answer questions. Camera angles simulate those used in real races. © Unified Field Inc. 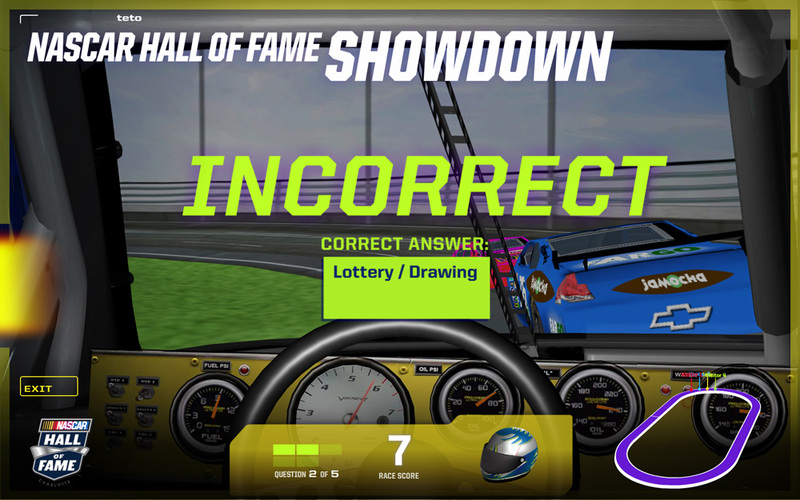 The trivia/racing interface shows the inside of the driver’s car as questions are asked and shows their current points, position relative to other players, and answers. 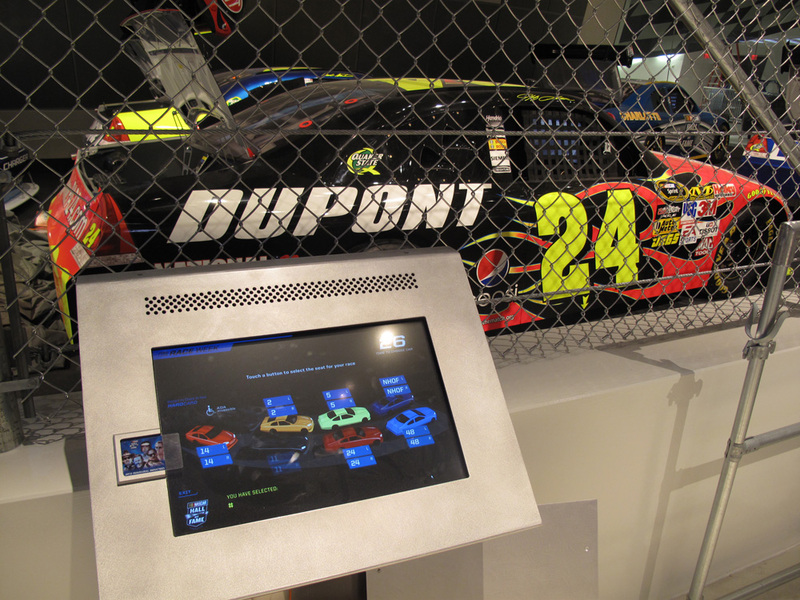 The cars in the interface were also 3D models and move depending on real-time player standings. © Unified Field Inc. 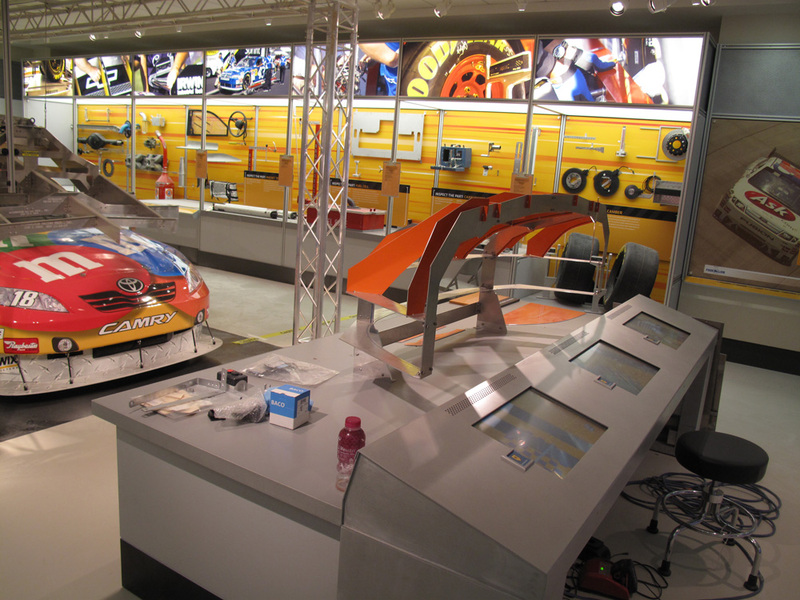 In another area of the museum is the Inspection exhibit, which shows how cars are inspected before and after races. 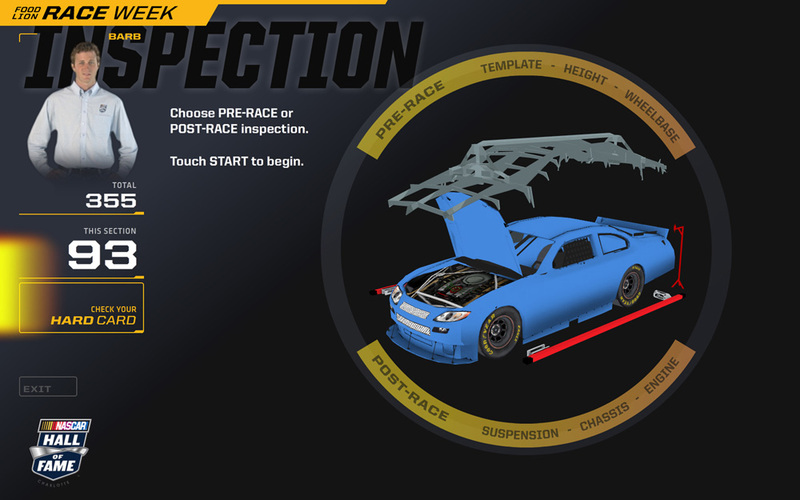 The pre- or post-race inspections are presented as a series of mini-games that tests a visitors ability to inspect cars correctly. 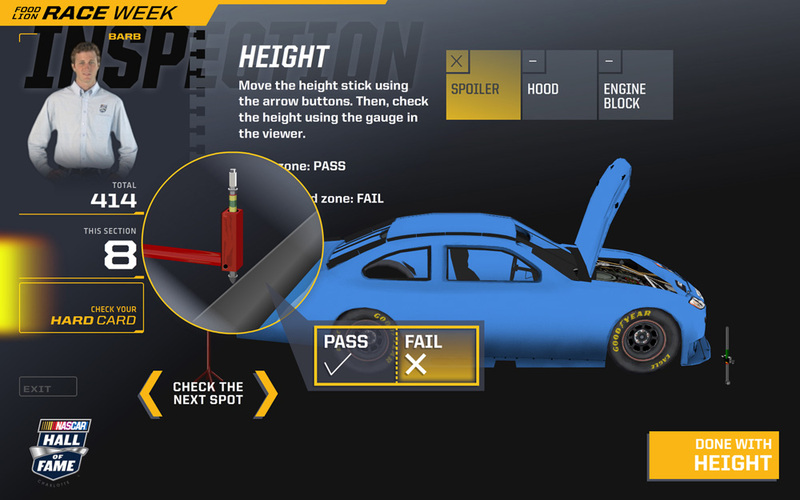 The interface revolves around a 3D model of a car, and 3D instruments that are repositioned depending on which inspection is being conducted. The visitor is presented with a choice to proceed doing pre- or post-race inspections. © Unified Field Inc. Height inspection. 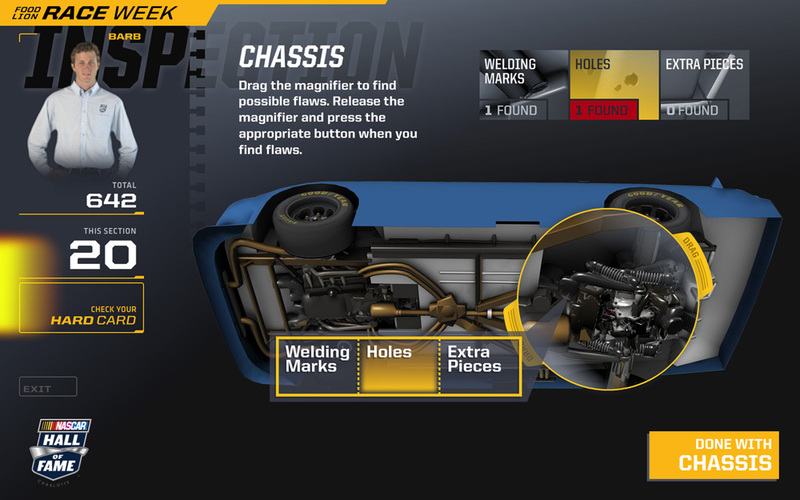 Inspection of the chassis where visitors use a magnifying glass to find defects on the underside of the car. © Unified Field Inc.